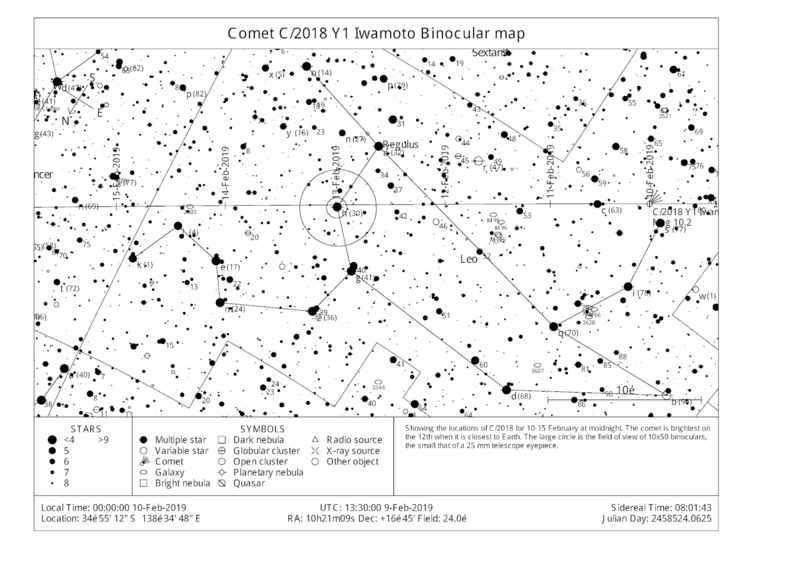 Comet C/2018 Y1 as seen looking north from Adelaide at 2:30 ACDST on Monday the 11th of February, when the comet is (almost) highest. 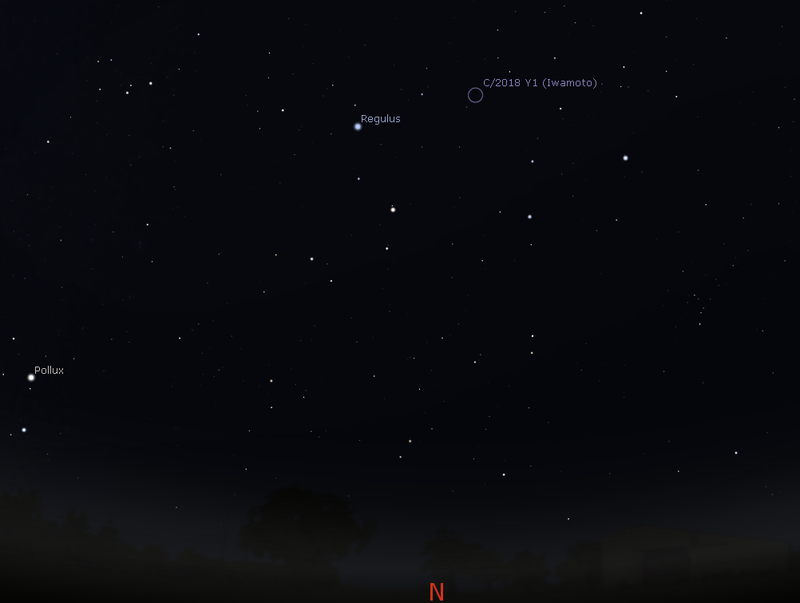 Similar views will be seen in elsewhere in Australia at the equivalent local time (click to embiggen). Comet C/2018 Y1 as seen looking north from Adelaide at 2:30 ACDST on Tuesday the 12th of February, when the comet is brightest and (almost) highest. 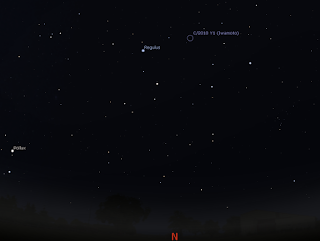 Similar views will be seen in elsewhere in Australia at the equivalent local time (click to embiggen). 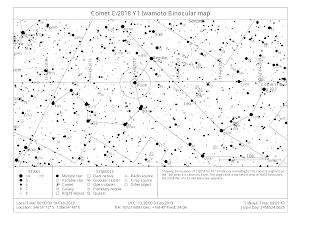 Comet C/2018 Y1 as seen looking north from Adelaide at 2:30 ACDST on Wednesday the 13th of February, when the comet is(almost) highest. 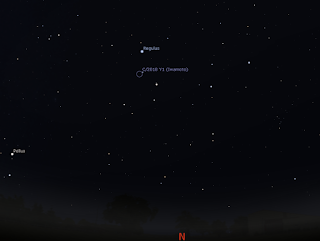 Similar views will be seen in elsewhere in Australia at the equivalent local time (click to embiggen). 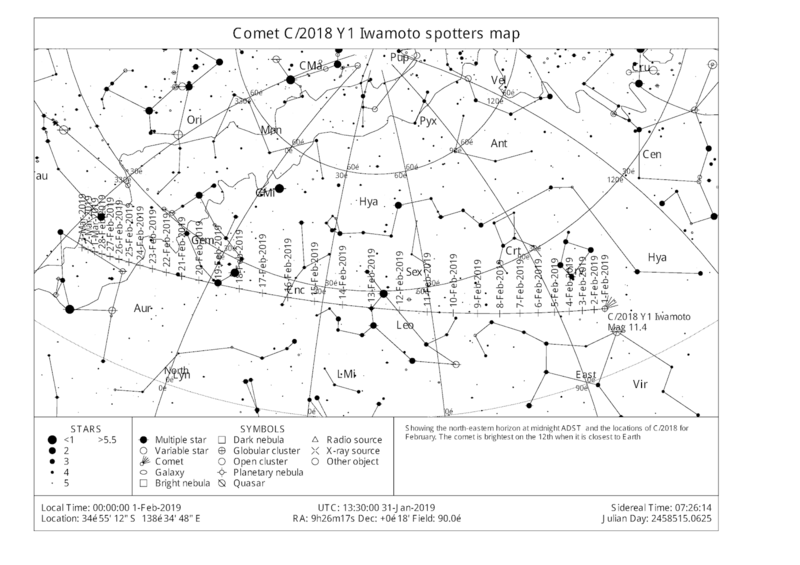 Just a reminder that comet C/2018 Y1 ( Iwamoto ) will be at its brightest over the next few days, notionally peaking on the 12th. 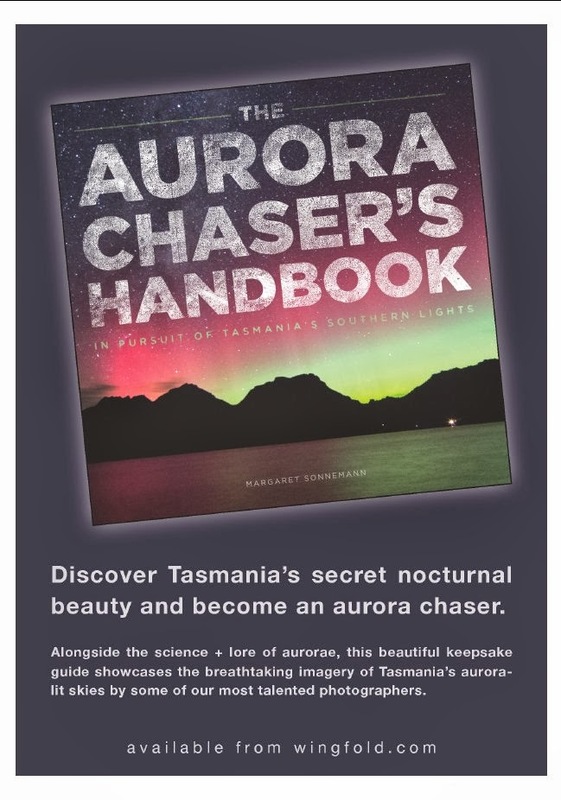 Australian observers are reporting that the comet is around magnitude 6.5, easily visible in binoculars, and long exposure astro-photographs are revealing a nice little tail. The comet is currently in Leo. 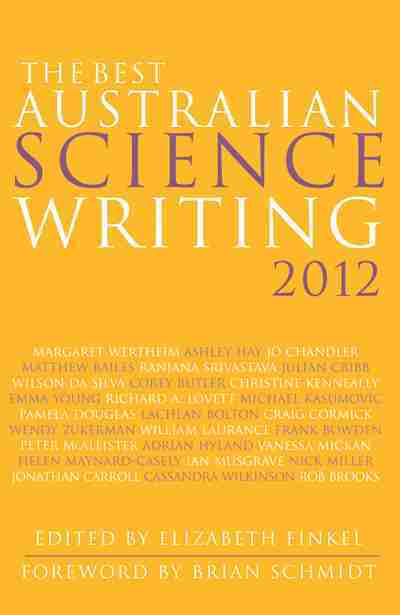 It is rising about 9 pm (ACDST and AEST), is about 25 degrees above the horizon at 23:00, which is good for beginning observation and is highest around 2:30 (ACDST) to 3:00 (AEDST). The moon sets around midnight, so will be out of the way for early morning observations (23:48, 00:00, 00:22, 11th 12th an 13th respectively). 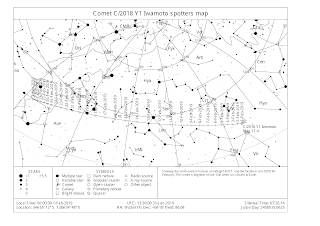 On the 10th (morning 11th) the comet is in the same binocular (spotter scope) field as Sigma Leonis. 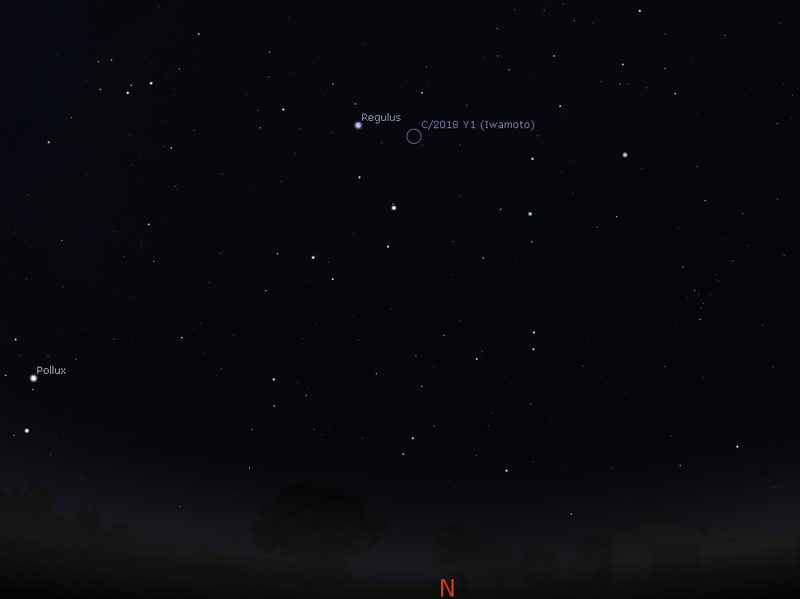 On the 11th (morning 12th)it is between sigma and rho Leonis. 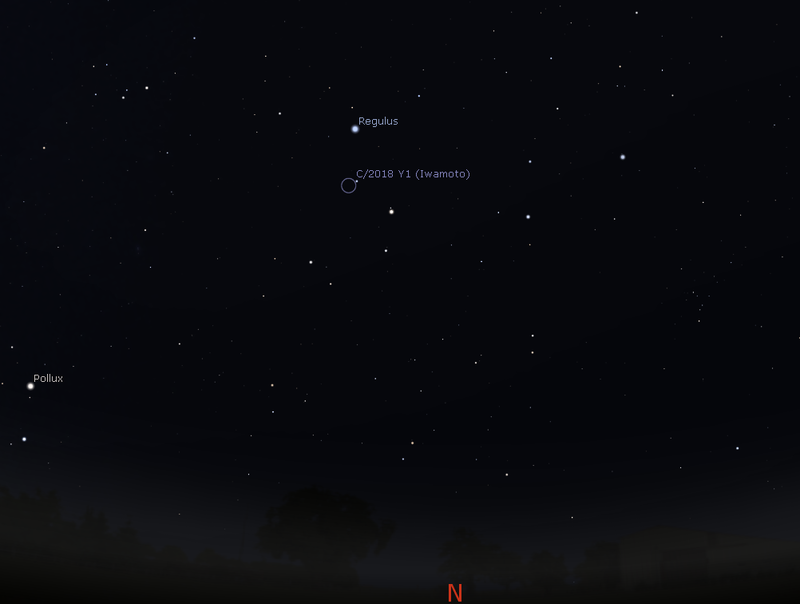 At its brightest it is just below Regulus, just outside of a binocular field, forming a triangle with rho Leonis and Regulus, so will be relatively easy to find. On the 13th it is almost on top of eta Leonis, so should again be very easy to spot. 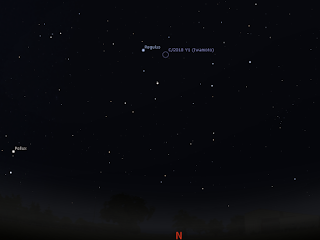 On the 14th it forms a triangle with Lambda and epsilon Leonis, and again should be easy to find. I saw the comet after a bit of searching. Quite diffuse, but obvious near Regulus, especially so with averted vision.